Let me get this out of the way: I'm not a Trekkie. I was a loyal Star Wars fan until the prequels and thereafter switched my science fiction allegiance to Neal Stephenson. So forgive me if I can't come up with enough Star Trek quips or effectively weigh in on the Kirk vs. Picard debate. I can, at best, recite the lines from the J. J. Abrams film and shout out "Khan" when somebody cuts me off in traffic. Also, I can tell you about this here Star Trek MMO that's been something like six years in the making. Star Trek Online is a massively multiplayer game previously under development at the now-dead Perpetual Entertainment. Cryptic Studios picked up the aborted project in 2008 and started almost completely over for the game we have now. I saw a quick demo of a space combat and ground combat before being turned loose on the mission "Stranded in Space" which combines elements of the two. The game is due out February 2, 2010. Canon Clarity: Licenses are a funny thing – so much so that the developer couldn't exactly articulate to me what Star Trek Online can and can't do as far as incorporating stuff like the Borg and Space Lincoln. They did say that the MMO should be treated as canon since it takes place in the prime timeline (the non-J. J. Abrams one) and that canon things like the Borg might show up. However, there was some confusion about the alien races that players can customize right down to the skin color. As Cryptic seems to understand it, if a custom-made alien race gets really popular, it could become canon if enough people download it. The possibilities are heady and all; but it's kind sad to think somebody could put a lot of work into building an alien race of their own that then magically winds up in a new Star Trek movie and they don't get any credit for their creation. No Catchphrases/Bridge Banter (Yet): Currently, the only talking that goes on between non-playable characters and the captain that you take the role of happens in text boxes. There's no free-flowing banter between bridge crewmates and no way to click on individual NPCs during away missions just to chat them up. Cryptic says they're currently looking into adding the catchphrases we're used to hearing from the series during space combat ("Warp speed," "Reroute power to the shields," "Great shot kid, don't get cocky," etc.) – but at the moment, it's all silent and somewhat stilted. Space Isn't Slow: I was afraid the space combat and travel would be too much like Eve Online – where you have to wait ages for anything to happen. Instead, I was pleased to see somewhat snappy movement and reasonable physics to account for the fact that you're maneuvering a huge starship, not a tiny fighter craft. And while the game confines the 360 degrees of space to just forward, back, left and right for the shields, you have the full range of 360 degrees to use in movement so you can evade fire and break line of sight (and tachyon blast) by getting behind asteroids and stuff. Also, the game gives the player the ability to throttle more or less power between the four sections of the shields. This comes in handy when you're too close to a ship about to explode and need to absorb the shock on your aft shields. Ground Isn't So Bad: It's totally not regulation for a captain to take half the bridge planetside with him as an Away Team (that's what Red Shirts are for! ), but the game lets you do it anyway with your three favorite bridge crew members. While in space, these members have special abilities and buff/debuffs depending on their class (Science Officer, Communications, etc.) – but on the ground, you can outfit them with whatever weapons and equipment you like and either let the AI drive them around, or command their every move. The Away Team will still bring some special abilities with them planetside like Harvesting or Diplomacy stats you can use. But if you don't feel like making room for them, you can always leave ‘em on the ship and meet up with other real-life buddies on some planet to shoot at stuff. 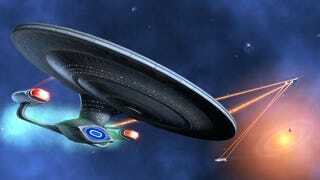 Set Phasers To Vaporize! During ground combat, when people are shooting NPCs, you'll sometimes see a yellow icon pop up on a disoriented enemy. Pressing the secondary fire on a certain gun vaporizes that enemy and it's pretty neat. Who needs a stun function, anyway? I wasn't so wowed by the ground combat, but space blew me away. If this were a singleplayer game, I'd still be happy with it. But I guess with so many Trekkies in the world, it'd be a waste not to turn Star Trek into an MMO for the masses to enjoy.